Kaffeman is one of the few contemporary artists to exploit the full creative potential of lamp-worked glass. In this work, she explores the complex psychology around our urge to touch things that are both beautiful and dangerous, alluring and repulsive. 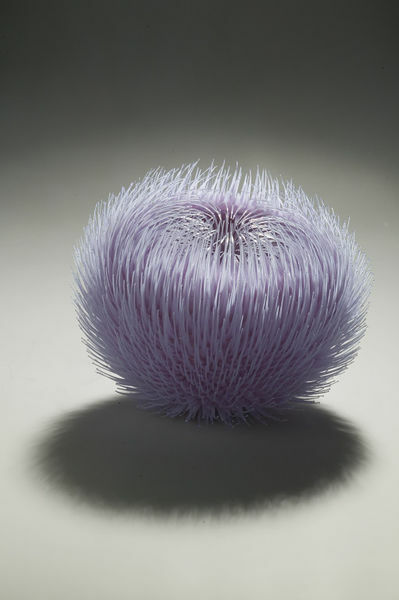 Pale blue globe composed of lamp-worked glass filaments supported by a silicon core, the whole resembling a flower-head or large sea urchin. 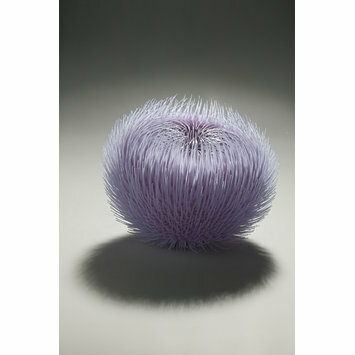 Height: 19 cm approx., Diameter: 24 cm approx. This loan from the American Friends of the V&A will become a gift 4/12/2010. Historical significance: Kaffeman is one of only a few contemporary glass artists to explore the full creative potential of lamp-worked glass. This piece is one of a series called 'Tactual Stimulation' in which she explores the urge to touch something at once beautiful and dangerous which allures while repelling. This is the first work in glass by an Israeli artist to enter the V&A's collections for a very long time and probably ever. Dafna Kaffeman was born in Jerusalem in 1972, beginning her art education there at Bezalel Academy. She concluded her studies at Gerrit Rietveld Academy and Sandberg Instituut, Amsterdam, in 2002. Her work, exhibited in Europe and the USA, has been recognised with numerous awards and prizes. She lives in Israel where she is now head of Glass Studies at Bezalel Academy. See object information file in Ceramics & Glass section.